1 pound mild Italian sausage 1. Heat oven to 375°. Set two large skillets out to the stove. 1 small-medium yellow onion 2. Heat 1 tablespoon oil in each skillet, placing both over medium high heat. Dice onion, place into one skillet. Using a mandolin, slice squash and mushrooms to 1/4“ thickness; add to second skillet. 2 medium-sized yellow squash 3. Add pork sausage to onions; season with garlic, Italian herbs, red and black peppers, and salt. Stir frequently to break up large pieces and encourage browning. 2 large portobello mushroom caps 4. Once zucchini and mushrooms are soft, remove from skillet and place in large bowl. Melt butter in skillet; allow to brown just slightly. 1 cup tomato sauce of choice 5. Sprinkle butter with flour and whisk thoroughly. Allow to brown slightly. 1 15oz can diced tomatoes 7. Pour tomato sauce and tomatoes over meat; reduce to a simmer and allow to bubble while you finish the bechamel. 2 tablespoons butter 8. Cut cream cheese into cubes and add to roux. Whisk until melted. Slowly add half and half, still whisking. 1.5 tablespoons all purpose flour 9. Reduce heat to low. Pay attention to the thickness of the sauce - it should be thick enough that you can scrape away the sauce to see the bottom of the pan, but only for a second or so. You still ultimately want a sauce, not a spread. Add hot water if more liquid is needed; season accordingly before removing from heat. 4 ounces cream cheese 10. Toss mushrooms and squash with bechamel. Set aside. 1 cup half and half 11. Grease a 9×13 or similarly sized pan. Add a ladel of meat sauce to bottom, then top with 3 lasagne noodles. They do not need to fit perfectly; it is fine if they break. 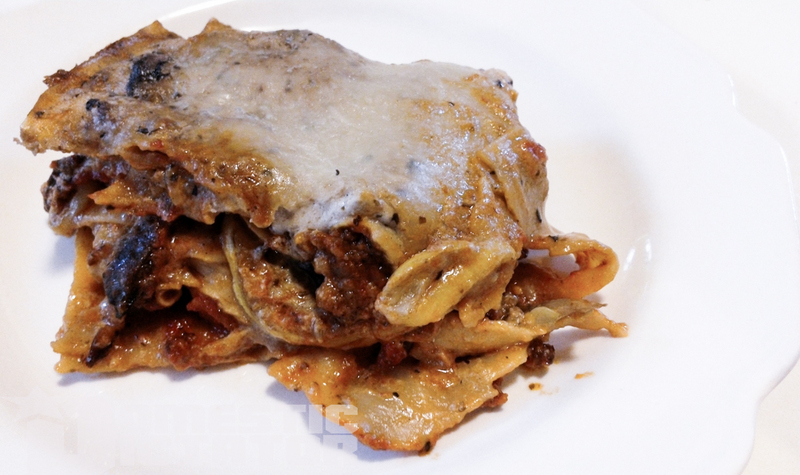 9 sheets no-bake lasagne sheets 12. Top with bechamel and vegetables and more meat sauce. Sprinkle with cheese. Continue with this pattern (noodles, vegetables, meat, cheese) until you reach the top layer of noodles. Top with whichever sauce you have left, sprinkle with mozzarella, and cover with foil. 2 tablespoons olive oil 13. Bake for 25 minutes. Remove foil, and bake for an additional 10 minutes, or until cheese is melted and slightly brown. 1 teaspoon each garlic powder, Italian seasonings, red pepper flakes, black pepper, and salt 14. Allow to cool for 10-15 minutes before slicing, to retain form. Serve with a light salad and a delicious red wine - no more needed! There are many more vegetables and meats that work well here; experiment!